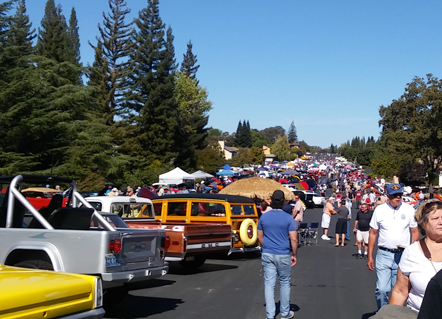 On Saturday, September 30, 2017, the Placerville CHP (California Highway Patrol) hosted the Cops & Rodders Show and Shine Fly-In at the Cameron Airpark with community event proceeds benefitting the Placerville CHP Community Fund. For the car or airplane enthusiasts, a large showing of new and vintage cars and airplanes were on display. Guests were welcomed with live music, food trucks, and other vendors providing breakfast, lunch, and beverages for purchase. Also on display were numerous law enforcement agency vehicles and aircrafts. A popular spot for attendees was the United States Army helicopter on display, where guests of all ages were permitted to jump inside to snap a picture. 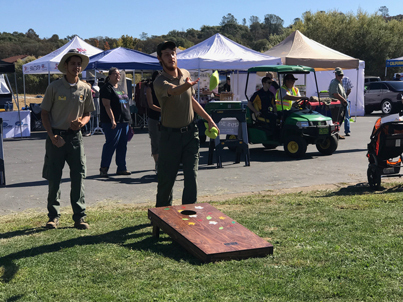 A highlight of the event was the Kid’s Zone where activities were provided by the El Dorado County Office of Education, El Dorado County Library, Choices for Children, Coloma State Park, Environmental Alternatives, Sierra Wildlife, Thompson’s Auto, and Toys for Tots. The Kid’s Zone provided fun activities for kids of all ages including corn hole, Birds of Prey (on display), face painting, and much more. Dr. Ed Manansala, El Dorado County Superintendent of Schools, even stopped by the Kid’s Zone and demonstrated his juggling skills!